You can’t keep baby from growing up, but you can help them do it in style in this sweet fringe bootie. Its supple leather will form to their foot with every step, while its padded footbed will keep them completely cozy in the meantime. A simple tie closure promises easy on and off. A layer of fringe and hand-stitched details make these infant moccasins beloved by children all over the world. These Minnetonka Fringe Bootie Tan Moccasins are a simple and classic touch of style for little boys and girls. You can’t keep baby from growing up, but you can help them do it in style in this sweet fringe bootie. Its supple leather will form to their foot with every step, while its padded footbed will keep them completely cozy in the meantime. A simple tie closure promises easy on and off. A layer of fringe and hand-stitched details make these infant moccasins beloved by children all over the world. These Minnetonka Fringe Bootie Brown Moccasins are a simple and classic touch of style for little boys and girls. Jefferson is the leader of lite-ness and our original EVA all-star. There’s a reason this name has been echoed from all corners of the globe since the beginning. Keeping the original shape that made the Jefferson so mighty, we swapped the EVA upper for our 3D elasticized Liteknit formula, intricately blending this classic creation to form. Native Shoes Jefferson 2.0 Liteknit is also hand washable, odor resistant, and of course beast free. Modern munchkins look to the Native Phoenix, our newest no-lace sneaker. Finessed instead with an orverarching elastic strap to hold feet in place, the Phoenix gears up with a two-part EVA outsole for double the heel cushion. 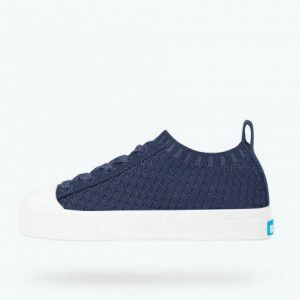 This slip-on Native shoe is also comprised of a lycra mesh upper and soft neoprene heel. Jefferson is the leader of lite-ness and our original EVA all-star. Like any reigning ruler of the ring, the Jefferson encompasses all of the fine features that you’d expect from Native Shoes. It’s shock absorbent, odor resistant, hand-washable, and also comes in an infinite assortment of colors and treatments. Jefferson Pigeon Grey/Storm Blue has capabilities only clouds could dream of. Hold the phone, it’s the athletic aesthetic you’ve been waiting for in an EVA sneaker. A legend by leaps and bounds, the Native Shoes Lennox Block Ski Patrol Red boasts a three-part molded EVA construction and dual-density compression outsole, meaning it’s full steam ahead for our latest fan favorite.